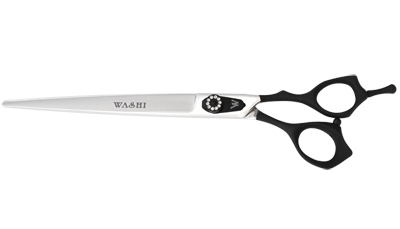 Authentic Washi NF02 K 80 Dog Grooming Shears - effectively handles volume and heavy coats. The Washi NFO2 K 80 Raiders non slip grip shear features a convex edge that effectively handles volume and heavy coats. The offset handle is ergonomic to fit most hands. Made from Japanese 440C steel, this beautiful cutting tool will maintain a sharp edge for many years.